Your Tribute supports your community and bestowing it is your sovereign responsibility. An income-based sliding scale Tribute/Exchange of $33-$13 per person is due in advance of each ritual attended. Other offerings have different Tributes—please see our schedule for more information. We do not turn away anyone for reason of financial hardship. If you in need of offering an Energy Exchange in lieu of a monetary Tribute, please discuss this in advance with the ritual’s First Priestess. Energy Exchange is offered only through advance discussion with the Priestesses and is determined ritual-by-ritual based upon this criteria. One half of your Tribute goes directly to the ritual’s First Priestess in support of sustainable priestessing and to show respect for her work. The other half of your Tribute goes into our community treasury. 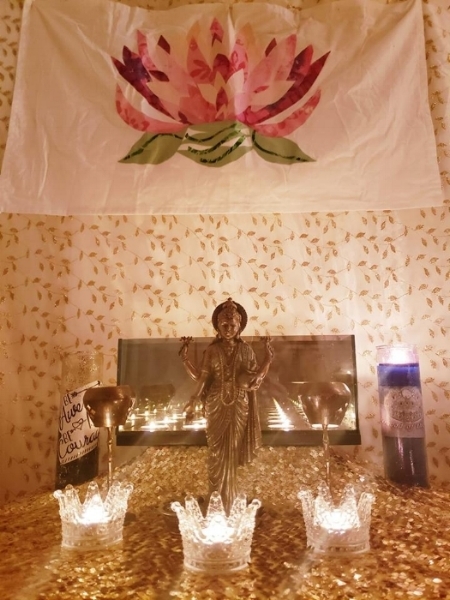 Treasury funds are used to pay for ritual and Sanctuary supplies, expenses incurred in opening and maintaining the Sanctuary and Sacred Grove, fees associated with pursuing non-profit status, travel expenses, and finishing the construction of our sacred space. Your Priestesses devote an abundance of time, energy, and other resources into planning each ritual, ensuring that we all have a quality spiritual experience. Since all of our rites are planned specifically for those who RSVP, if you cancel the day of ritual or do not show, you are still responsible for your Tribute to the Sisterhood. We do not offer any refunds. If you would like to show your support for our mission, we gratefully and enthusiastically welcome any Tribute you are called to bless us with. Please see our Sanctuary Wish List for our Amazon Wish List for our current needs or make your donation via the Paypal button below. We appreciate all contributions, large and small! It takes many resources to keep our community functioning smoothly and powerfully as we move ever forward towards self-sufficiency and sustainable priestessing. Although it is highly encouraged, attendance at all circles is not mandatory. We understand that you have family, children, friends, work, school, and other interests in your life. However, the more present you are within the Sisterhood community, the more you will get out of it, and the more rapidly you will find your life changing for the better as you manifest those things you deeply desire. We ask for your firm commitment in attending each circle to which you RSVP. If you are unable to come for any reason, or if you are going to be late, please contact that ritual's First Priestess. It is always our intention to wait for all Celebrants to safely arrive before casting the circle.